working in magazines and newspapers. They both have earned master’s degrees in journalism from the University of Missouri-Columbia. Throughout their careers they've had neighbors, friends, and people from church ask them to photograph their weddings. 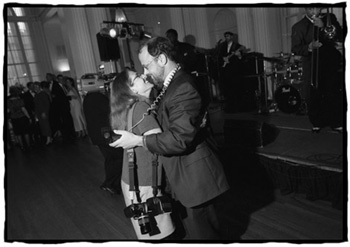 They have used journalistic methods to photograph weddings and have had a great time doing it. two experiences. Several years ago they started Cherish This Moment. Susie Post Rust has been working as a freelance photojournalist since 1990 and her passion is documenting people's lives. For ten years she worked primarily for the National Geographic Society, both in the magazine and book divisions. She and Adam started this documentary wedding photography business when they started a family. Other clients have included Life Magazine, People Magazine, US News & World Report, and Newsweek. Her most recent National Geographic story was in August 2003. She has worked in more than twenty countries in Africa, Europe, South America, Central America and North America. To see Susie's editorial and personal projects, go to http://www.susiepostrust.com. Adam has been working as a newspaper photographer and editor since 1995 at the Chicago Tribune, the Mobile (AL) Press-Register, the Morgantown (WV) Dominion-Post, and the Birmingham (AL) Post-Herald. Adam's passion is in documenting the moments of daily life that reveal a person's feelings or motivation. In 2003, Adam earned a second master’s degree in City and Regional Planning from the University of North Carolina-Chapel Hill. Adam has freelanced as both a photographer and writer for many publications, including the Chicago Tribune, the Pittsburgh Tribune-Review, the Kansas City Star, the Washington City Paper, the Associated Press, Education Week, Crisis Magazine, and Poz Magazine. He has also completed assignments for non-profit and corporate clients including Catawba College, Ford Motor Company, the National Institute of Computer Assisted Reporting, MDC, and National Resource Center for Prisons and Communities.